LONDON, England (CNN) -- Fiat is looking to become the world's second biggest automaker after Toyota through deals with troubled U.S. carmakers Chrysler and General Motors. CNN's Jim Boulden explains how Fiat's fortunes rose while its U.S. rivals crashed. Fiat's new 500 has proved popular with car buyers. Q. Why does Fiat want to form an alliance with Chrysler and a takeover of GM's European operations? A. Fiat wants the Chrysler alliance (meaning no monetary investment) to get hold of Chrysler's few goodies -- Jeep and people carriers -- and hope to sell them through its distribution networks in Asia, Latin America and Europe. Chrysler has had to do this, with limited success, on its own. 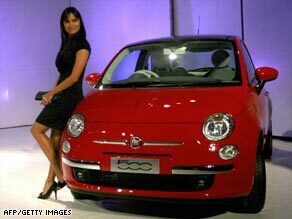 Fiat of course also wants to re-launch Fiat and Alfa Romeo into a skeptical U.S. market. Fiat wants to tap into the small car market if Americans actually start to buy them. But the prices for small cars will have to rise, if the likes of Fiat or Ford are to make a profit on them. Why GM Europe? Fiat's Sergio Marchionne says the car maker has to increase yearly output from some two million to five million cars a year. Combining Opel, Vauxhall and Fiat, while also closing plants, moving some production to lower cost centers and ramping up output seem to be the plan. There are many, many obstacles to this. Q. In a nutshell how did Chrysler get into this mess, and how could a possible merger with Fiat save it? A. Chrysler makes expensive, gas guzzling muscle cars, people carriers and Jeeps which sold well in the boom and dropped off the cliff when gas prices soared. It did not have much of a global footprint. Chrysler is dead without Fiat. There is no plan B.
Q. How will the cars be branded? Will the Chrysler, Opel and Vauxhall marques survive? A. It is likely that all the brand names will survive. There is no reason to kill off names, other than maybe a few Chrysler brands. In fact, the Fiat plan would be to re-badge the small Fiat cars with Chrysler names in the U.S. since Americans are more likely to buy a Chrysler than a Fiat. Q. Where is Fiat's money coming from? A. Government loans. Fiat is about $6 billion in debt. Would you loan money to Fiat for this? Q. How many jobs will be at risk if the merger and takeover goes ahead? A. Job cuts in Europe do not seem to be the priority, given that the plan is to increase car production when the economy recovers. Vauxhall is already cut to the bone. They could just kill the brand and get rid of the plants, but that is not likely. Sure, merging Opel with Fiat would lead to some rationalization, but it's unlikely the German government will give Fiat a loan to close German assembly plants (though its engine factory is on the block apparently). As for those jobs at Chrysler, there aren't many now anyway. Q. How has Fiat managed to turn around its own fortunes in the last decade? Is the Italian company itself safe from the downturn in car sales? A. Fiat was a mess in 2004, forget about the last decade. The Agnelli family hired someone from outside the company, and someone with international experience (Marchionne lived for years in Toronto) to take on the unions and the government in order to turn Fiat around. He made cuts a local simply could not do. It seems that he's confident he can do that again. Q. Is the deal good for car buyers? What will it mean for prices in the future? A. Car prices are unlikely to be affected. It's the financing deals that are good right now, if you can get a loan. Q. What are political implications of such deals in Italy, Germany, Britain & U.S.? A. The German and Italian governments and the unions would have to back the Fiat takeover of GM Europe (Britain will have no say), or at least not be able to come up with an alternative. Then GM Europe would have to want to sell to Fiat and decide how much of a stake to retain. The U.S. government and unions have of course already backed the Fiat alliance with Chrysler.